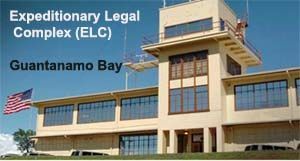 Stormy weather resulted in the cancellation of six days of hearings for the 911 defendants at Guantanamo, which scheduled to begin yesterday and first postponed until tomorrow. he U.S. National Hurricane Center’s tracking map shows Tropical Storm Isaac crossing Haiti as a hurricane on Aug. 24 and striking Cuba before arriving at the Florida coast below Cape Coral on Aug. 27. The hearings have not yet been rescheduled. 25 pretrial motions were on the agenda, including some by the media. Defense lawyers, journalists and representatives of non- governmental organizations including Human Rights Watch were on hand to watch the proceedings. The last hearing was in May. One of the defense lawyers said today trial is unlikely to occur until four years from now, due to the hundreds of motions that will be need to be resolved.